Fish. It's not a food I especially enjoy. Unfortunately, fish, like salmon, is good for you. And SP loves fish. It might be the smell - I can't stand fish smell. Of course, I also don't like the meat smell when we are near the meat department in a grocery store. And I don't like the smell of shellfish, but I love eating shellfish (crab, shrimp, lobster). What can I say, I'm odd. SP decided that, in an effort to entice me to eat fish, he'd start suggesting slightly decadent fish dishes. Like the one we made on Sunday. 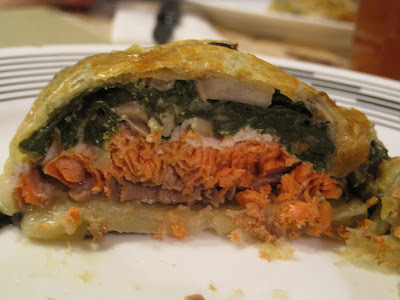 It's a salmon dish, but it's salmon 'disguised' in puff pastry and smothered with spinach and mushrooms and a sauce. I suppose the puff pastry and sauce cancel out the healthiness of the salmon, but... He first got this idea from a blog post on Good Things Catered for Salmon en Croute. This sounded similar to a salmon in puff pastry recipe in the puff pastry cookbook that I got for Christmas. We ended up following both as rough guidelines. 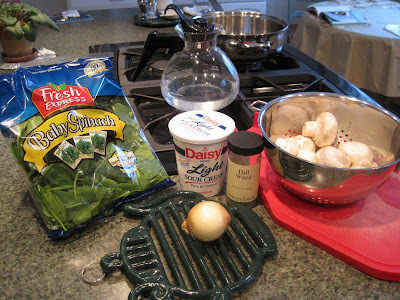 One calls for just spinach, the other for mushrooms with greens on the side. 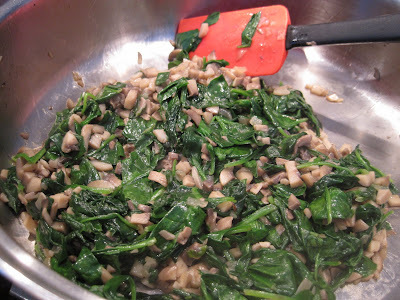 We decided to use mushrooms and wilt spinach in with the mushrooms. One recipe calls for cream cheese for the 'sauce' while the other calls for creme fraiche or heavy cream. 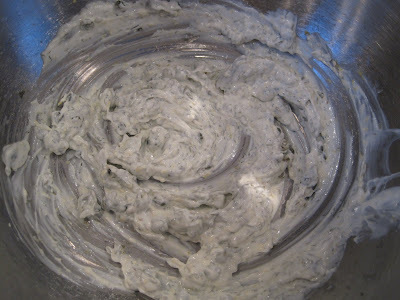 We decided to use light sour cream with the lemon, dill, and capers. Here's our huge, Costco jar of capers: Thirty-two ounces of capers!!!! 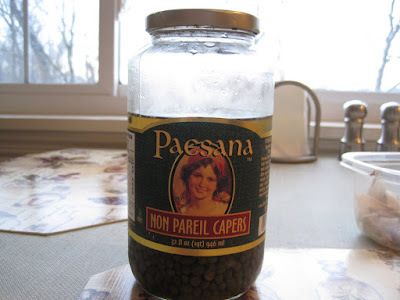 I'm not sure how long we've had this jar, but I made fun of SP when he bought it, telling him that we'd never have to buy capers again!!! We chopped the capers for the 'sauce.' 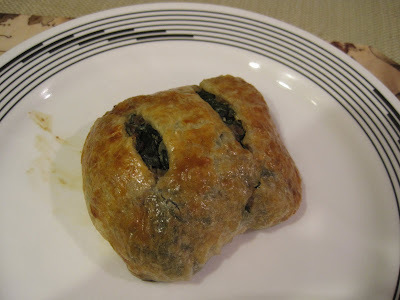 Here's the 'sauce' that we added to the mushroom-spinach mixture: SP put the pastry pockets together while I started cleaning up dishes and the kitchen. This means we didn't take any pictures between the first step: and the final result: His hands were all fishy and saucy while mine were soapy so we didn't dare touch the camera!! To assemble the puff pastry pockets, he cut the skin off the salmon, rolled out a puff pastry sheet, cut it into 4 squares, put some salmon on each square, topped the salmon with the mushroom-spinach mixture, folded the puff pastry over the filling and sealed the edges, cut some slits in the top, refrigerated them for an hour, and then baked them for about 25 minutes. These were good. Not my favorite because it is fish, after all. I could have used more sauce and right as I made that comment we remembered that one recipe has a sauce on the side but we forgot to make it. Oops. We made the beurre blanc sauce on the side Tuesday night with the last 2 pastry pockets. It was 1/2 stick butter, lemon juice, capers, onion, pepper, and parsley. It was definitely a nice addition to the dish. SP likes the puff pastry pockets on their own without the beurre blanc sauce though he agreed it added a nice touch; I like it better with the sauce (but of course a sauce of mostly melted butter isn't healthy!). That salmon en croute looks delicious! The filling and sauce look like they'd be pretty versatile. 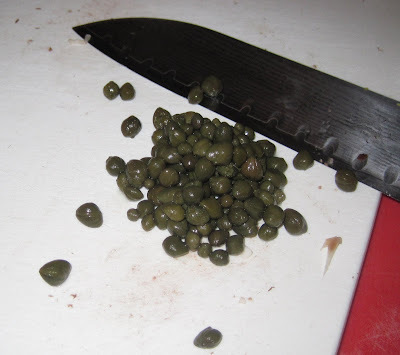 (I heart capers and dill.) Any particular proportions on the sauce? Simmer lemon juice & shallot until liquid is reduced to about 2 tbsp. Reduce heat. Add zest. Whisk in butter chunks, one at a time. Keep heat low so butter emulsifies into a creamy sauce and not oily sauce. Add capers and parsley. Season to taste with salt & pepper. We halved the beurre blanc recipe since we had only 2 puff pastry pockets left. I guess I should also post the other quantities! 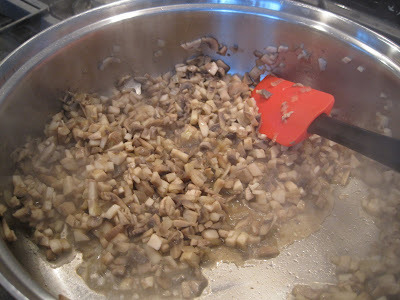 Saute mushrooms & onion until mushrooms have given off all their liquid. 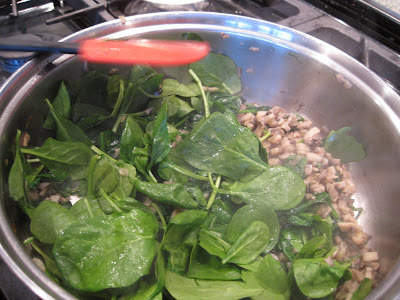 Wilt in spinach. Remove pan from heat, let cool a bit, stir in sauce ingredients (we mixed the sour cream, capers, etc., together in a separate bowl then added it to the mushroom mixture). Season salmon with salt & pepper. 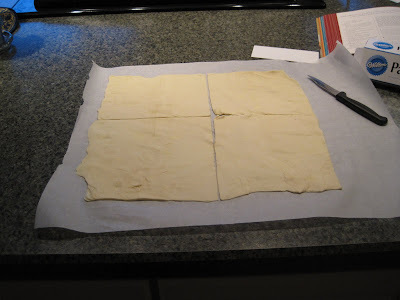 Roll out puff pastry sheet to 14 inch square. Cut into 4 7-inch squares. To assemble, put mushroom mixture on pastry square, then salmon. 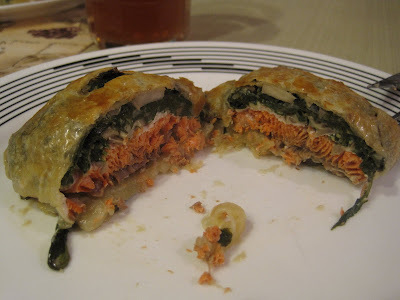 Moisten pastry edges w/water & bring each corner to center on top of salmon. Press firmly along seams and try to smooth out any bulky portions. Pleace salmon bundles, seam side down, on parchment lined cookie sheet. Brush w/beaten egg. Cut slits in top for steam to escape. Chill at least 1 hour, up to 24, loosely covered. Bake at 425 for 23-28 minutes (salmon should be cooked to about 145 F on an instand read thermometer). Serve w/beurre blanc sauce on side. I can't do salmon. In fact, I remember when my old neighbor used to feed her cats -salmon- cat food. It ruined it for me. Fish is off & on for me... In fact, the fish I made yesterday is such a rarity. I agree, I prefer shellfish!